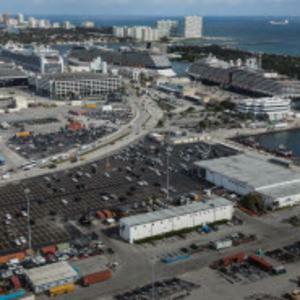 BROWARD COUNTY, FL - Horizon Terminal Services, LLC is driving more automotive business to Broward County&apos;s Port Everglades with a new long-term lease on 8.67 acres where the company plans to invest $630,000 for a new auto processing facility that would create a minimum of 25 local direct jobs. Horizon is moving to 8.67 acres (a 5.67-acre parcel plus a 3-acre outparcel) with an existing warehouse adjacent to the docks in the Midport section of the port from its 5.73-acre short-term location in the port&apos;s Southport area. Relocating to the Midport site provides operational advantages over the Southport site because there is a shorter distance for brand-new vehicles to travel between the ship at berth and terminal yard and a lower potential for the vehicles to be damaged during this transit. Carrying two million standard car units annually worldwide, Horizon is a wholly owned subsidiary of Höegh Autoliners (Höegh), and is one of the world&apos;s leading "roll on/roll off" vessel operators. A global powerhouse for international trade, Broward County&apos;s Port Everglades handles more than one million TEUs annually (20-foot equivalent units, the industry standard measurement for container volumes) and serves as a gateway to Latin America, the Caribbean, Europe and Asia. Located within the cities of Fort Lauderdale, Hollywood, and Dania Beach, Florida, Port Everglades is in the heart of one of the world&apos;s largest consumer regions, including a constant flow of approximately 112 million visitors statewide and 6 million residents within an 80-mile radius. Port Everglades has direct access to the interstate highway system and the Florida East Coast Railway&apos;s 43-acre intermodal container transfer facility, and is closer to the Atlantic Shipping Lanes than any other Southeastern U.S. port. Ongoing capital improvements and expansion ensure that Port Everglades continues to handle future growth in container traffic. More information about Broward County&apos;s Port Everglades is available at porteverglades.net or by calling toll-free in the United States 1-800-421-0188 or emailing PortEvergladesCargo@broward.org.